Each night, as I tuck my twin daughters into their own beds, I remind them that they should stay there ALL NIGHT. They insist that their toddler beds are uncomfortable, or as they pronounce it, "not comfy-beatle." I don't know what that excuse says about my mothering, but they seem to think discomfort has a better chance at convincing me to let them sleep with us than a bad dream or feeling lonely. On any given night, usually between midnight and 2 a.m., one or both of them will creep in silently and crawl up my side of the bed. Why is my description sounding weird and scary? I was going for sweet and cute. Anecdote fail. I'm trying to say that my 4 year olds are cuddly little things and they behave their very best and quietest in order to sleep in our bed. Their length of stay depends on how closely they spoon me, because my husband is a light sleeper, and if he notices any wiggling, the girls will be unceremoniously kicked out. They used to protest with wailing and piteous cries, but they've long since learned that their blubbering doesn't work on a sleepy father who has to work the next day, so they now trudge back to their beds of nails and crawl under their Tinkerbell covers where they sleep until morning. 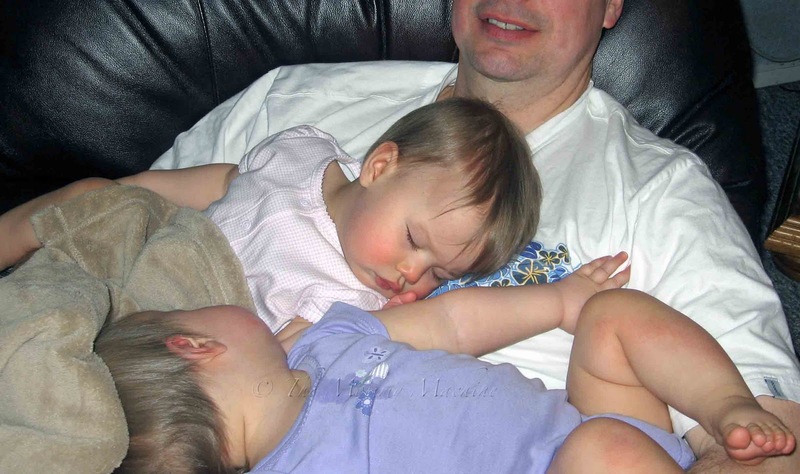 I've got a picture of me in bed with the twins when they were newborns, all snuggled up against me, but I can't find it anywhere; this photo of my husband in his recliner with the babies napping on his tummy will have to do . . .
and you've got an idea of how I'm sleeping most nights. Not comfy-beatle. The strange thing is, I don't really mind. Utter sweetness! I'd say that I wouldn't be able to resist, but I've been there, done that with Sweetums. Making her go back to her own bed was a NIGHTMARE. Oh I absolutely love it, love it, love it! I'd give anything to get my three year old out of our bed. I told her she was going to start sleeping with her sisters and she said, "No way, how would Daddy hold me all night?" And she's right, he literally holds her all night long. Both of mine have always done really good about staying in their own rooms. That pictures is SOOO super sweet! I'm so behind on blog reading and trying to get caught up! I love this picture - oh so sweet. My son hated sleeping in his own bed, he would rather sleep on the floor of my bedroom - that is until his baby sister was born, he cherished sleep more than my floor. BTW, his baby sister is 9 1/2 years younger than him. While the first anecdote might have failed - the bed of nails was great! this is really cute haha.. i understand your twins. i and my sister (we're not twins but most people think we are) would crawl into my mom's bed while she's still sleeping and we do that a lot even when I'm already 27! hehe..